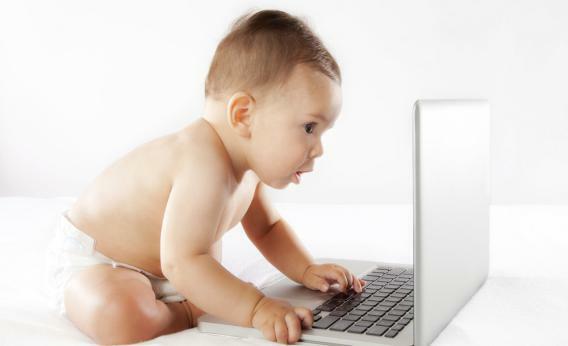 Twitter for babies: Media elite tweet in the voice of their kids, think of their children as brands. In more ways than one. Why is tweeting for your child worse than shredding her privacy by posting a photo of her in the bathtub on Facebook? It’s not. Privacywise, the Facebook impulse is worse, especially now that, as Amy Webb points out, the site has changed its privacy settings yet again to make it easier for users to tag one another. (And to hide the path for opting out of sharing—all for the benefit of advertisers.) But turning your baby into your Twitter puppet is another kind of sin. Think about it: You’re appropriating your child’s voice, before he or she can even talk! And then you’re using that voice, inevitably, to tell us about the contents of her diaper. What kid is going to appreciate that when she’s 13? And that’s just the most obvious objection. It’s also grating for parents to be so hypersavvy about social media branding that they can’t let their kids sort out their online lives for themselves—later, when they have minds of their own and might choose not to ever have a real-name account on Twitter. And then there’s the way in which tweeting for your baby stands for the larger scourge of parental narcissism: of parents using their children as performance art. You pretend it’s about them, but it’s really all about you and your own cleverness. Yes, I know, it’s all meant to be good fun, and it is in fact possible to make your kid’s Twitter voice funny and appealing. I also know that we all brag or natter on tiresomely about our kids. But once you’ve started a social media account in the voice of your baby, you’ve given yourself a reason to keep speaking in it. You’ll be on the lookout for your own baby bon mots rather than focusing on, say, your kid’s actual lived moments. When exactly do you plan to turn yourself off?